JDaddy and CDog Talking Sports: Was Brian Bosworth A Prophet? Was Brian Bosworth A Prophet? 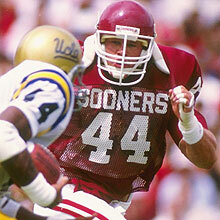 Standing on the Oklahoma sideline was All American Linebacker Brian Bosworth. The "Boz" was the most polarizing college football player of his generation. Always good for a quote, Bosworth never shied away from controversy and this game would be no different. The man who would be voted on the "All Century College " team and voted as one of the "Top NFL Flops" of all time was about to go Prime Time. With network cameras on him, Bosworth unveiled a t-shirt with NCAA written in big letters. Under the letters was "National Communist Against Athletes". It would be his last stand. Even fellow goofball Barry Switzer had seen enough and the kid who in 1986 made both the NCAA Football All American team and the Academic All American team was gone. "One possibility is the four-team playoff, or the so-called plus-one approach, that would create two national semifinals and a championship game played one week later. The original proposal, made in 2008 by the commissioners of the Southeastern Conference and Atlantic Coast Conference, was emphatically shot down by the leaders of the Big Ten, Pac-10, Big East, Big 12 and Notre Dame. But momentum is clearly growing for a larger playoff system.Big Ten Commissioner Jim Delany acknowledged this week that he would now consider the prospect of a four-team field." Really? So,Now let's see..... Delany who may match Bosworth in ego size may support a playoff. Long a bully due to the influence of the Big 10, what Big Jim sees, is the handwriting on the wall and it is all about the cash. A playoff format is coming and you can bet, Delaney sees that the Southeast Conference and eventual Big 12 will dominate the games for years and the cash will flow to those conferences. Remember when each team had a 10 game season and then a bowl game? Then we got the "Kick Off Classic", then all teams could schedule 11 games, then a conference championship game was allowed. All decisions are based on money. Funny that riches make us all forgetful. And in recent news, while coaches break contracts, don't finish seasons and in some cases leave schools in the midst of sanctions....... The NCAA has tabled any discussion of raising the $2000 yearly stipend athletes receive because of abuses it might cause. We Got Your Super Bowl Right Here! Anyone Still Aware LSU And Alabama Have A Game?